Audio feedback can be a very useful alternative or supplement to written feedback. Make sure you are in a suitable place to do an audio recording and are working on a device with a microphone. Open the submission for grading (see Provide Grades and Feedback on individual assignment submissions), scroll down to Audio feedback (PooDLL) and click Allow in the small pop window to allow Moodle to access your camera and microphone. Then Close. 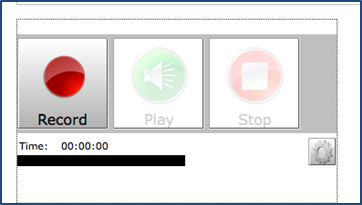 In the recording window, click the red Record button when you are ready to start. Click Stop to finish. Audio of this sort should be short – no longer than 3 minutes. You will then see the screen on the left below as the recording is prepared and uploaded. On completion, the Play button will be available. Click it to listen to your recording. If you need to re-record your feedback, just click Record again and the original will be overwritten with the new one. Remember to Save changes to complete the process. When a student views an assignment after grading, they will see a play bar in the Audio Feedback section. They just click to play the recording on any device with audio playback.